Last year I sat in on a senior capstone course on international policy. The idea was to assess a particular problem in US policy and make recommendations. One of the student projects recommended that the US could start a revolution in the particular country they were advising on by promoting Internet access in the country. I was incredulous and had to repeat back to them what I was hearing before I could believe it. Apparently they had read Wael Ghonim’s maxim ” if you want to liberate a society just give them the Internet” as policy rather than exuberant hyperbole. I had to explain to them just a few of the complexities of the so-called Internet revolution in Egypt–the decades of labor movements, protests, political blogging and other elements that allowed the 18 days in Jan and Feb 2011 to become a tipping point. The professor was suitably chagrined at how her students had embarrassed her. But to be fair, many professionals have written things almost as naive. That’s why I was gratified to read a recent brief account of the uprisings that focused on the prelude. That’s the key point of a recent paper by the Electronic Frontier Foundation’s Director of International Freedom of Expression Jillian C. York. The EFF has just published an on-line version of York’s “The Arab Digital Vanguard: How a Decade of Blogging Contributed to a Year of Revolution” published earlier this year in the Georgetown Journal of International Affairs 13(1): 33-42. York begins with the Arab world’s internet connectedness beginning in 1991 and outlines some of the relationships between the growing on-line technologies and the efforts of anti-torture workers, free expression activists, labor unions, and human rights organizations. She walks readers through the rise of blogs, Facebook, Twitter and YouTube, highlighting the differences between the ways these forms of media were used in the Middle East in comparison with their rise in the West. As bloggers began to be perceived as threats by Egyptian security forces, they began to arrest prominent on-line activists, some of whose stories York briefly summarizes: Alaa Abd El Fattah, freed after a massive on-line campaign led bloggers around the world to rally to his cause; and Wael Abbas, whose video records of torture by the Egyptian security forces were taken down by YouTube as “inappropriate” but restored after a global campaign. She briefly summarizes the rise of “citizen journalism” and the emergence of such Facebook pages as “We Are All Khaled Said” as part of a domino effect in which the sheer multiplicity of social media sites became part of the protest process. It’s an engaging account of of one part of the larger picture, with great references (she even cites this blog, which shows she must know what she’s talking about). It’s a great summary of the standard Western narrative about the role of social media featuring the usual players. There is, as usual, only cursory attention given to the role of labor movements and the efforts by many social media users to sync their activities to those of labor strikes and protests. 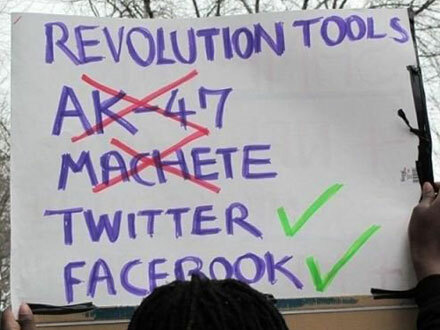 And the role of social media among Muslim activists, including the so-called “new Muslim Brotherhood youth” is absent.